MaBim is an hospital baby cot with an opening rotating side that facilitates the contact between the mother and her baby ensuring a safe co-sleeping, since it prevents the child from the risk of crushing and falling. The cot can also be used for the transport of babies and thanks to its variable height it can approach and overcome every bed, common chair or wheelchair. MaBim is the only baby cot that allows effective face-to-face contact with the baby and to take him in arms without getting out of bed. It approches wheelchairs facilitating the disabled parent in taking care of the baby. Transparent for the monitoring of the baby, MaBim allows doctors to visit the baby easily without moving him from the cot. MaBim is made of transparent methacrylate. 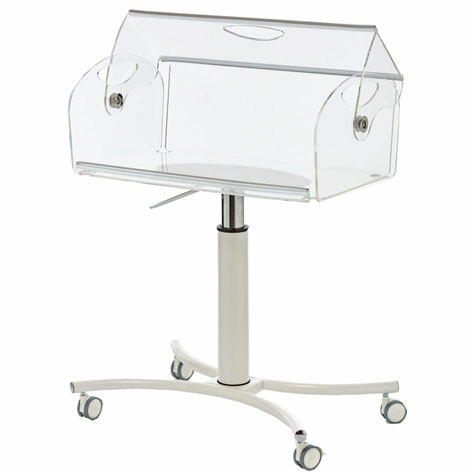 Its base is in white painted steel with variable height, equipped with four swivel castors all with brakes. Accessories: mattress and storage shelf. Total dimensions (LxWxH) 75x44x86 / 114cm. Cot dimensions (LxWxH) 75x44x28cm. Please watch also the MaBim Twins for twins. The cradle MaBim fosters the maternal bonding, allows a safe co-sleeping and continuous monitoring of the baby. The MaBim baby cot is born to ease a safe co-sleeping without risk of crushing or falling for the infant. It is a useful tool for accelerating the maternal bonding simplifying the rooming-in procedure: immediately after childbirth , the newborn stays in the room with his mother during the entire day. 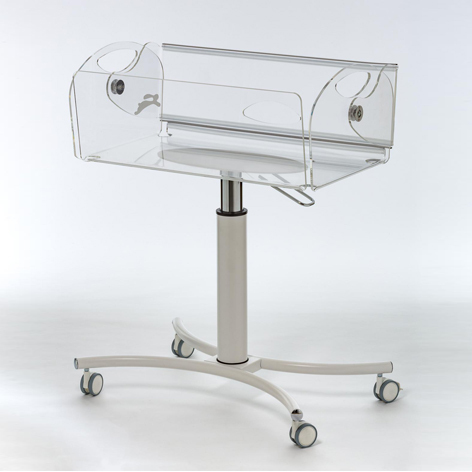 The MaBim baby crib is made of transparent methacrylate to facilitate the continuous monitoring of the newborn . It has an innovative totally opening and rotating side which allows mother and baby to stay in close contact with each other. MaBim can overcome every bed, chair or wheelchair and it can also be used as a traditional baby bassinet for newborn carriage. 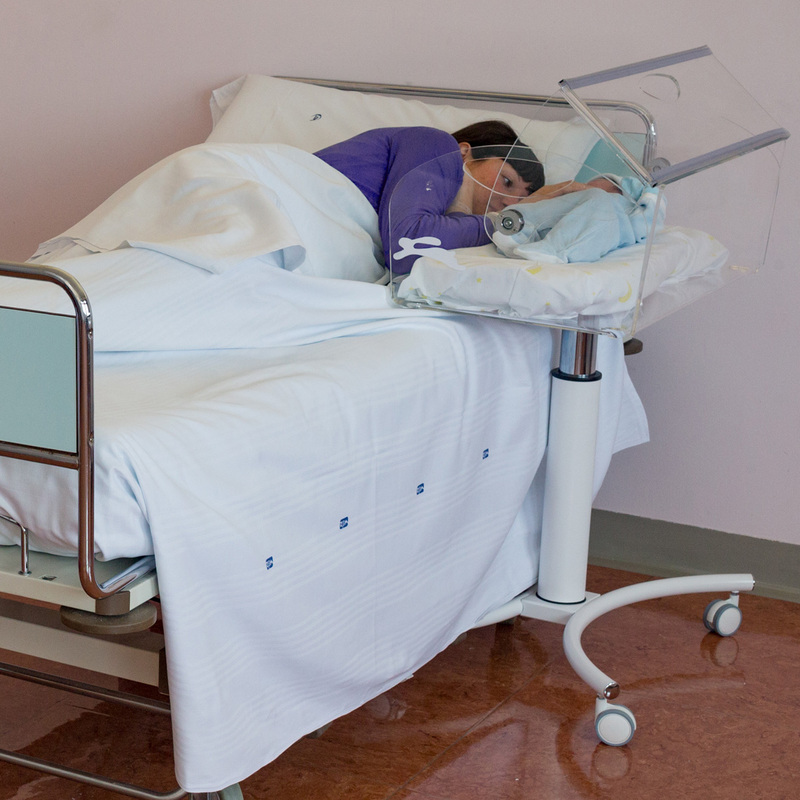 The MaBim neonatal cradle was created to allow a safe co-sleeping during rooming-in. The MaBim baby cot is placed next to the mother's bed, adjusting the height to overlaps the bed. The wheel brakes are locked and the side of the cradle opened to let the mother be in close contact with her baby. When the cot's rotating side is open and resting on the opposite side, the newborn is protected from outside. The newborn sleeps better feeling his mother's proximity and his mother learns to recognize in advance her baby's needs interpreting his signs in time. If the mother moves out her room, carefully she must close the cot's side, remove the brakes of the castors and push MaBim like a pram resting her hands on the curved edge. What are the benefits for people who use it? Co-sleeping (sleeping in contact with the baby) is an action of fundamental importance, because it allows to quicken the maternal bonding, that is the particular bond established between the mother and her son, which determines their mutual recognition and affection. Staying together immediately after birth, the woman and her baby benefit from the particular hormonal situation, which fosters their mutual recognition and falling in love: the oxytocin, defined as "hormone of love", reaches its maximum levels in the mother's body during the first hours after childbirth. For the newborn, suddenly catapulted into a new and unknown world, his mother's proximity is a guarantee for a better adaptation to his life outside his mother's belly. Also the maternal milk production increases thanks to the maternal bonding. The proximity of the mother to her baby has a stabilizing effect on her mood, conversely, their separation can cause the postpartum depression, called puerperal blues. Their mutual contact makes the newborn feel safer and makes the mother understand when she can rest with the baby, listening to the rhythm of its breathing. Mum takes her son in her arms without having to get out of bed: an important value for women who have just given birth, still have the after-effects of epidural anesthesia or have undergone cesarean delivery. What are the advantages of the MaBim baby cot compared to others bassinets? MaBim has been carefully studied by the architect Mitzi Bollani who collected the needs of babies, mothers and also hospital staff. The MaBim design has been developed taking into great attention ergonomics, safety and the various emotional aspects which influence the psychophysical well-being of pregnant women. The shape of MaBim is evocative, clean, rounded and simple. One side rotates on the opposite one, allowing the mother to stay in a full contact with her baby. That rotating side, resting on the opposite side, protects the newborn from the external environment (people, drafts due to an open window or air conditioner). The MaBim baby cot is equipped with four castors to be easily moved away in case of urgent assistance to the mother or the baby. 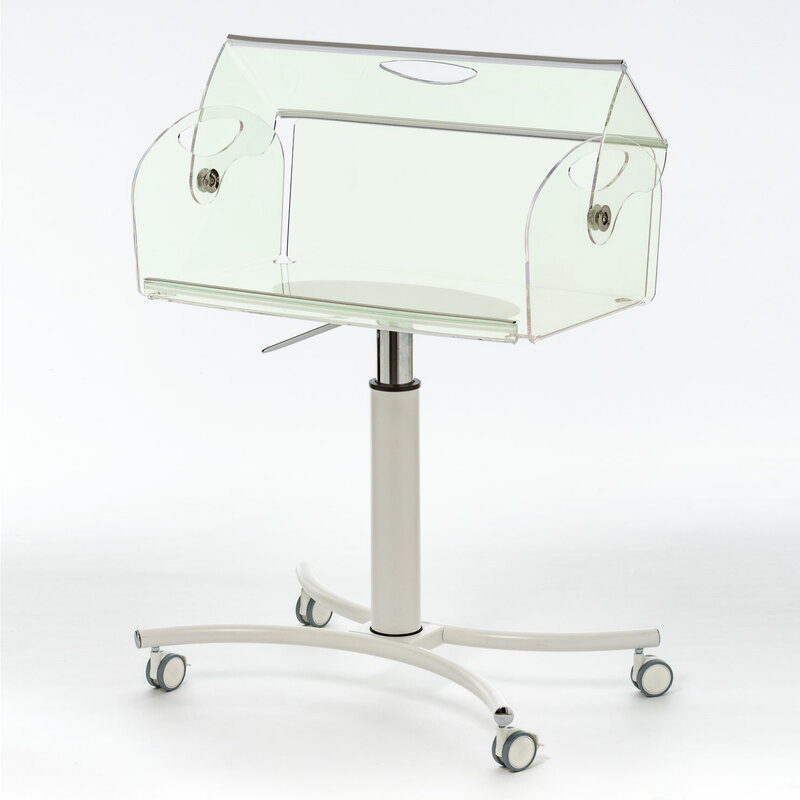 Its openable rotating side and height variation allow doctors to visit the newborn staying in his bed. The cot reaches a height of cm.86. The MaBim cot is equipped with a fireproof mattress. In case of thermo-heated mats use, the practical holes on the cot surface facilitate the passage of its cables and a practical storage shelf, fixed under the cot and available on request, holds the device supply. Rooming-in enhances the baby feeding. Mom breastfeeds her baby as soon as he shows interest in sucking. Their direct contact simplifies the night feedings and prevents the mother to get out of bed to take her baby in her arms, adding tiredness to post partum. MaBim is a cradle carefully designed to facilitate maternal bonding and safety. The newborn experiences the need to be reassured and his mother experiences the intense need to protect him. She must be helped to take care of him, so that when she comes home she feels capable and confident. In the early days, the nocturnal awakenings are physiological and the mother sleeping next to her son learns to tune with him, taking care of him. The mother's proximity favors the acquisition of an optimal respiratory and digestive rhythm, strengthens the immune system and reduces sensitivity to stress of the baby. MaBim allows a close contact between mother and baby: he feels safe and warm beside his mum, there is a lower risk of SIDS and of problems of thermoregulation, breathing and heart rate. The MaBim cot is made of non-toxic and transparent methacrylate. Its emotional shape is reminiscent of the wooden cradles of the past. Its rounded corners make it very easy to clean. The innovative value of the cot is its fully openable side which lets the mother and her baby in direct contact "face to face" and thus activate their mutual recognition. The MaBim cot is fixed to an elegant and minimal base in painted steel, with variable height, equipped with swivel castors with brakes. The base of the cot facilitates its approach to every hospital bed. MaBim can also be placed side by side the Leura's MimmaMà armchair, the Leura's Toast chair, any wheelchair or common chair. The cot is equipped with a fireproof and antibacterial mattress. MaBim is an ecological Designed for You&All product: every material is recyclable. The baby cot MaBim is very useful during the first months of the newborn's life even at home because it guarantees a safe co-sleeping. 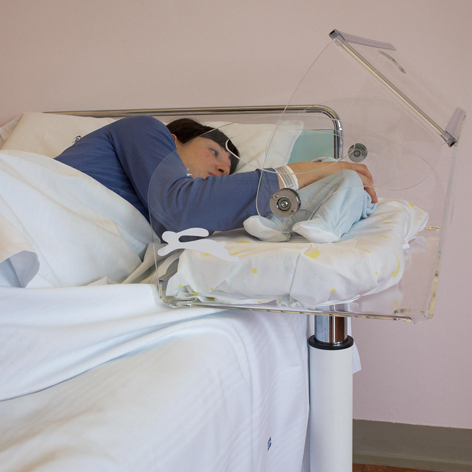 The cradle can be placed side by side every common bed, not only the hospital one. Thanks to its height variation it perfectly overcomes the mattress without leaving dangerous interstices. So the baby is in a higher and easy position then his mother, as if he is resting on a pillow. Their faces will touch and they can feel their mutual breath. The baby will be reassured and will sleep peacefully and longer. The mother holds her baby easily for the night feeding: with a simple and short movement she moves the infant on her chest. Thanks to its wheels, the mother can move MaBim in the rooms while she is doing her housework, she monitors her child sleeping and talks to him when he is awake. MaBim is made by Leura s.r.l. in different colors lilac, light blue or green to better fit in each children bedroom. For more information or request a quote please contact us at leura@leura.it.